In 1963, the three independent service ministries (Admiralty, War Office and Air Ministry) were merged to form the present MoD. The UK MoD is the government department that is responsible for all defence related aspects of UK National Policy. This large organisation, which directly affects the lives of about half a million servicemen, reservists and MoD employed civilians, is controlled by The Secretary of State for Defence. Minister of State for the Armed Forces. Minister of State for Defence Personnel, Welfare and Veterans. Parliamentary Under Secretary of State for Defence Equipment, Support and Technology. Parliamentary Under Secretary of State and Minister for Reserves. Parliamentary Under Secretary of State and the Lords Spokesman on Defence. Permanent Under Secretary of State (PUS): The PUS is responsible for policy, finance and administration in the MoD. As the MoD’s Principal Accounting Officer he is personally responsible to Parliament for the expenditure of all public money voted to the MoD for Defence purposes. The PUS is the most senior civilian in the MoD. Chief of the Defence Staff (CDS): The CDS acts as the professional head of the Armed Forces and he is the principal military adviser to both the Secretary of State and to the Government. Both the PUS and the CDS have deputies; the Second Permanent Under Secretary of State (2nd PUS), and the Vice Chief of the Defence Staff (VCDS). The VCDS acts as the Chief Operating Officer in the Armed Forces Chain-of-Command. Chaired by the Secretary of State for Defence this board is the MoD’s main corporate board providing senior leadership and direction to the implementation of defence policy. It is responsible for the full range of Defence business other than the conduct of military operations. Role of Defence: To help define and articulate the Department’s strategic direction, and provide a clear vision and set of values for defence. Targets and Objectives: To establish the key priorities and Defence capabilities needed to deliver the strategy. Resource Allocation: To ensure that Defence priorities and tasks are appropriately resourced. Performance Management: To manage corporate performance and resources in-year to deliver the required results. This committee is chaired by the CDS and is the MoD’s senior committee that allows the CDS to gather information and advice from the single service chiefs of staff on operational matters and the preparation and conduct of military operations. There are three single service boards: Navy Board, Army Board and the Air Force Board all of which are chaired by the Secretary of State for Defence. In general the purpose of the boards is the administration and monitoring of single service performance. Each of these three boards has an executive committee chaired by the single service chief of staff; Navy Board, Executive Committee of the Army Board and the Air Force Board Standing Committee. The MoD Head Office allocates resources to Top Level Budget Holders (TLB) who are then accountable to the Chief of the Defence Staff and the Permanent Under Secretary. TLB holders are responsible for the way in which their resources are allocated. The Chief of the Defence Staff (CDS) is the officer responsible to the Secretary of State for Defence for the coordinated effort of all three fighting services. He has his own Central Staff Organisation and a Vice Chief of the Defence Staff who ranks as number four in the services hierarchy, following the three single service commanders. 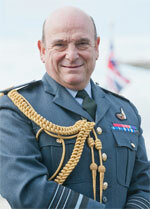 Chief of the Defence Staff Sir Stuart Peach was born in 1956 in the West Midlands. He was educated at Aldridge Grammar School, the University of Sheffield (BA), University of Cambridge (MPhil), RAF Staff College and the Joint Services Command and Staff College (HCSC). He holds two honorary Doctorates from Kingston University and University of Sheffield. He commanded the Air Warfare Centre at RAF Waddington from 2000 to 2003, was Director General Intelligence Collection in the Ministry of Defence 2003-2006 and Chief of Defence Intelligence and Deputy Chairman of the Joint Intelligence Committee 2006-2009. He held the appointment of Chief of Joint Operations at PJHQ(UK) from March 2009-December 2011 before becoming the first Commander of the UK Joint Forces Command from December 2011-Apr 2013. He was appointed as Vice Chief of Defence Staff in May 2013. He was appointed as Chief of the Defence Staff on 14 July 2016. Where appropriate the Vice Chief of the Defence Staff deputizes for the Chief of the Defence Staff. On a day to day basis he is responsible through the Central Staff for running defence business (with the Second Permanent Under-Secretary).